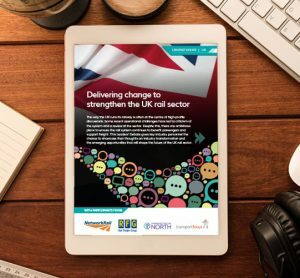 ProRail… on the right track! Further improvement through ‘day start’ In operational terms 2015 represented quite a challenge. On an annualised basis, punctuality scores for both passenger and goods services were very close to the levels agreed with the responsible ministry, but ice, storms, power outages and burst pipelines impacted performance in the first and fourth quarters. We have, of course, taken a range of steps to avoid any repetition as far as possible with one such measure being the introduction of the so-called ‘day start’. 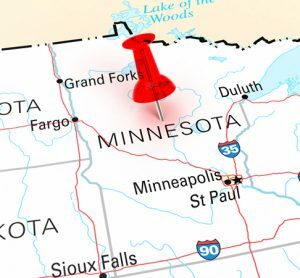 This involves looking at the previous day’s performance at a number of locations, both regionally and nationally, every two to four weeks. Our initial experience with this pragmatic approach is positive, and we are considering expanding the practice to more traffic management posts, including both passenger and freight services. In addition to measures such as preventative maintenance, training simulators and various ICT improvements, on which ProRail is spending around €60 million, agreements with contractors are another important driver for operational improvement. We anticipate further improvements by allowing contractors the opportunity to make full use of their expertise and by encouraging innovation. The new contracts, Performance-Oriented Maintenance contracts as we call them, will be put out to tender and our aim is to implement all track maintenance on the basis of these contracts within a few years. We are in constant dialogue with internal and external stakeholders to further refine these contracts – for example, by creating a new national registry for failures and their causes. Another initiative to help prevent disruption to passengers and freight is the new central Monitoring and Intervention Body, which will be established during 2016. This body is needed because the system of jointly modifying timetables by the Dutch Railways (NS) and ProRail is not always capable of resolving major disruptions quickly. For this reason, we undertook a complete redesign of the current system for management and intervention, including new traffic data management systems. This project has three phases, the first of which came into effect recently. The project should be completed by 2020. For some time already, ProRail has been engaged in the biggest renewal programme in the history of the Netherlands’ rail infrastructure. More and more people and goods are being transported across the Dutch rail network and this growth is set to continue into the future. The economy also benefits from more rail traffic and greater efficiency. In 2015 we renewed stations, opened new stations and renewed track at various locations throughout the country. Some €1.2 billion is being spent on station renewal projects alone. 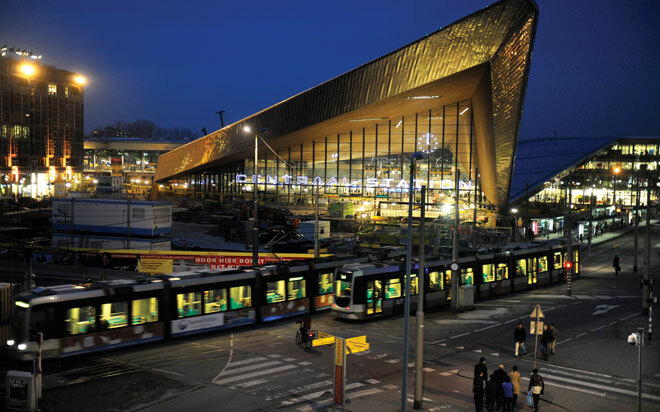 In 2015 we celebrated the completion of the remodelled Arnhem Central station and the surrounding area. The project, one of the largest post-war developments in the city, includes new buildings totalling 160,000m² of floor space in an area of 40,000m2. The new station will be able to accommodate the growing number of passengers and, in due course, will be one of the hubs for international trains to Germany. ‘This really is a cathedral for the railways, but one that is fit for the 21st century – a truly modern transfer point for passengers and an impressive point of entry for the city of Rotterdam. This is a fantastic building in every respect – reminiscent of a clock, a cosy living room, a warm welcome from a city whose hospitality is abundant’. This is just some of the praise received by Rotterdam’s new Centraal Station, named Best Building of the Year 2015. The association of architects (BNA) was impressed by the way in which the designers have resolved the spatial issues around the station and the jury was unanimous in its decision. In Delft a new 2,300m-long rail tunnel has been built, as well as a new station. The changes were necessary because the two-track rail viaduct that previously accommodated trains through this historic city was no longer able to cope with the growth in rail traffic, and the city’s old station had also become cramped. The project is a striking example of underground construction with an eye for the quality of the surrounding area, taking account of the historical elements of the city and the bodies of water in the immediate vicinity. 2015 also saw the opening of a new rail traffic management centre in Utrecht; one of the most important hubs in the Dutch rail network because of its central location. The new station is located outside the evacuation area of ​​Utrecht Central. All the power facilities and IT systems have been installed in duplicate, and the station is equipped with a hybrid refrigeration plant and an energy-generating roof fitted with solar panels. This means that the new centre also helps to reduce our CO2 emissions. It goes without saying that travellers need to be able to count on a safe journey; that railway employees should be able to rely on a safe working environment; while safety for those living next to rail lines must also be addressed. Every accident is one too many and the same applies to disruptions to rail traffic. Good progress has been made on a number of fronts during 2015. The number of train collisions and the number of derailments were both down from the previous year. The number of red signals passed also fell from around 150 per year in the period of 2011-2013 to just 86 in 2015. This proves that conflict-free planning, the improved version of the automatic train protection system (ATP-Vv) and the automated alarm signal for red signal passes are all having the desired effect. Further improvement measures are also on the horizon: in 2016-2017 an ATB-VV system will be installed at 400 extra signals; a new alert method will be introduced (ORBIT); and a new system providing up-to-date route information for drivers will also be brought in. Several developments required particular attention in 2015. Certainly, the rail network is essential for mobility in the Netherlands – contributing to the economic development of all regions – however, the more trains using the network, the greater its impact on society. And a train that is traveling at full speed can be a risk. Partly due to last year’s results, we are going to make this a priority. In 2015 the number of accidents at level crossings rose, as well as the number that involved fatalities. The number of suicides also increased to 198. The measures that we are taking include a new plan to reduce the number of crossings that are not actively secured; implementing more calming lighting in train stations; improving the cooperation with the police and emergency services; and developing suicide prevention programmes in partnership with Dutch Railways (NS). We will also be taking legal action more often in cases of unacceptable behaviour on the part of rail users. ProRail is constantly on the lookout for high-quality, innovative solutions and intensified co-operation is one means to achieve just that. We will pool our knowledge with our partners: carriers, contractors, engineering companies, infrastructure management, universities and research institutes. We are also working with other infrastructure specialists: the Rijkswaterstaat for roads and waterways; Schiphol; the Rotterdam Port Authority; Alliander and Vitens, to name but a few, sharing knowledge in the so-called ‘Next Generation Infrastructures’ partnership. Together with these knowledge partners, we are working on smart solutions for the logistical and infrastructural challenges of today and tomorrow. A good example of the new services we have recently introduced is the Intelligent Platform Bar, which provides travellers with dynamic boarding information using LED lights. We have also introduced count-down displays, which since last year have been helping drivers to leave stations more punctually. 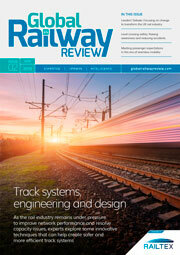 Advanced software for the cameras fitted in trains has also been introduced – helping to make the rail network safer – and we are looking at the possibility of using a higher voltage power supply (3 kV) in overhead power supply lines. This would mean that trains could run faster and closer together, helping us to meet the needs of an ever growing number of rail passengers. We operate with a staff of fewer than 4,000 in a context of continuous budgetary pressure, carrying out our work in a country with an extremely dense rail infrastructure. We invest a great deal of time and energy in making constant improvements in the work that we do, and partnerships with various other parties play a crucial role. We are currently working on the largest track renovation project in the history of the Dutch rail network, so we have a lot on our plate. However, the fact that customer satisfaction improved in 2015 is a good indication that we are on the right track. We’ve introduced our ‘performance dashboard’ on our website1 so everybody can keep track of our performance on a daily basis. Pier Eringa studied at the Dutch Police Academy and has mainly been active in the public domain. After serving as Municipality Inspector, he was Districts Manager, Commissioner of Police, Regional Executive director at NS and Director Safety. Thereafter he held various functions at the Dutch Ministry of Internal Affairs and today Pier serves as Chairman of the Board of the Albert Schweitzer Hospital and, since April 2015, as CEO of ProRail. He also serves a Co-Chairman of the Dutch Soccer Association (KNVB) and the Supervisory Committee of the Dutch National Police.